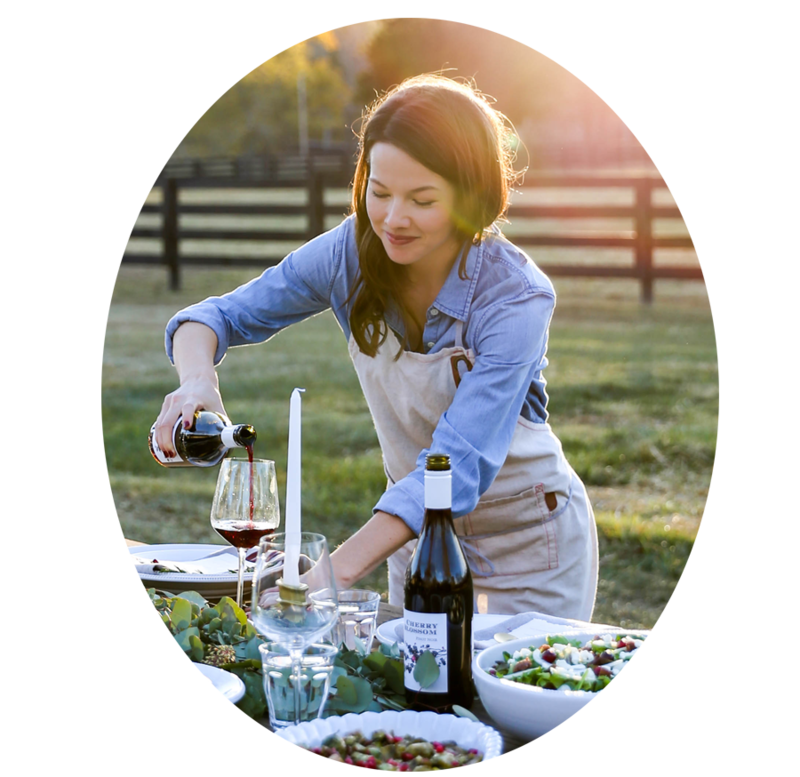 Despite popular belief, grapes are not just good for making wine, cheese boards and Dimetapp. They are actually a highly versatile berry that can be roasted much like any other to complement pork tenderloin, roast chicken or even a scoop of vanilla ice cream. 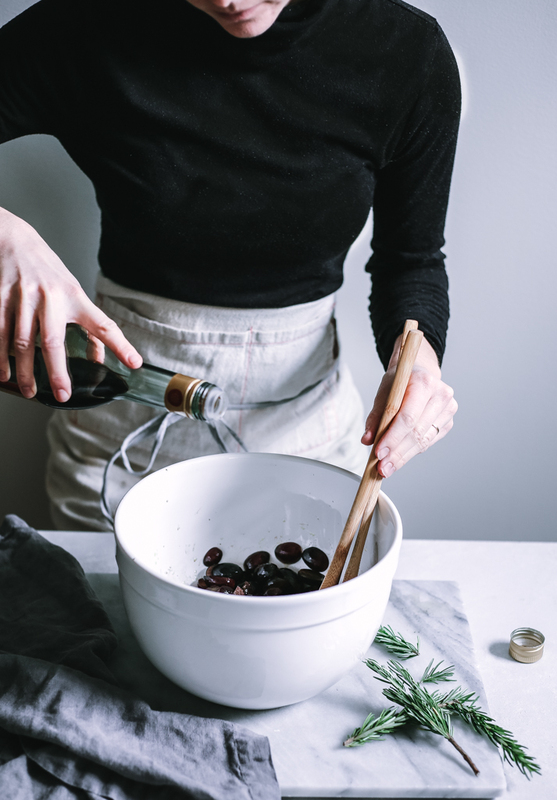 Top them on a pizza with salty gorgonzola cheese, or add them to your next loaf of olive oil bread, I promise you’ll be delightfully surprised and a little confused as to why you hadn’t cooked with grapes sooner. 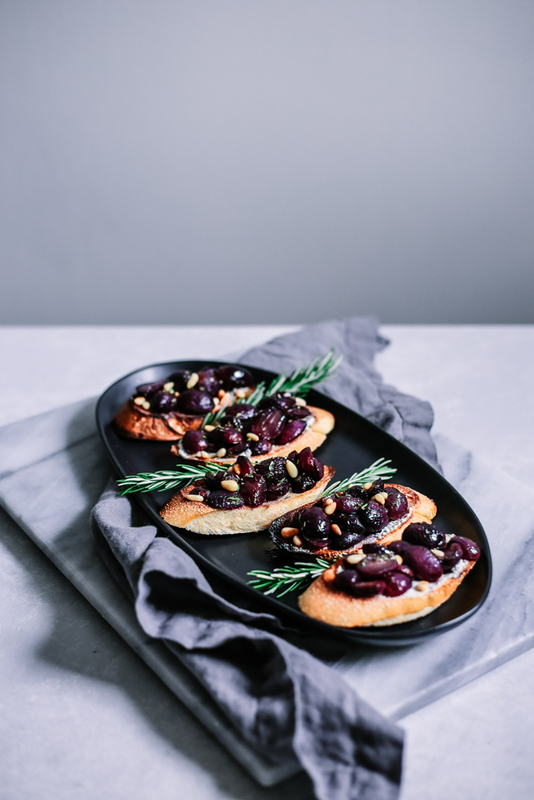 Today, I want to share this delicious recipe for Balsamic Roasted Grape Crostini just in time for your holiday gatherings. This recipe checks all the boxes! It’s simple to make, requires few ingredients, plates and shares well and is a bit unexpected. 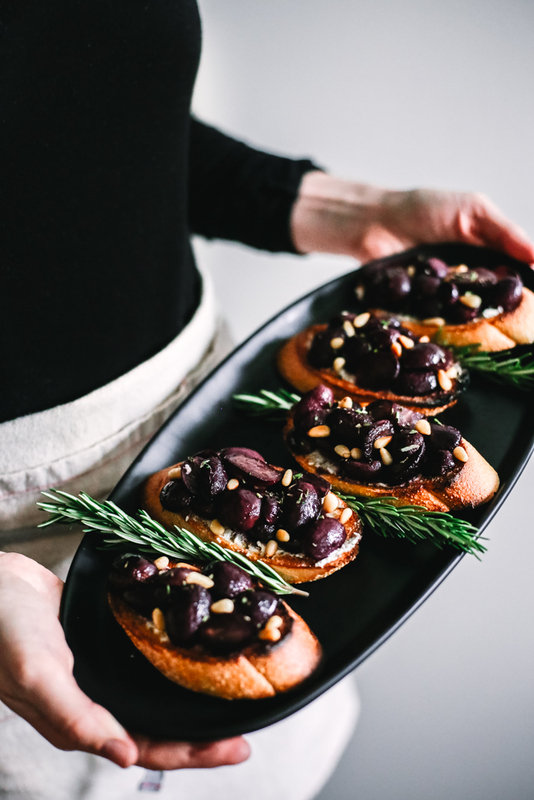 Before roasting, I like to toss the grapes with a bit of balsamic vinegar and olive oil and then perfume them with a few pinches of fresh rosemary leaves. Once in the oven, it won’t be long before you hear them simmering away, releasing their flavorful and fragrant juices. I like to pull them out of the oven just before they start to lose their shape. Then, it’s time to pile them high atop a toasted baguette with a smear of herbed goat cheese and a garnish of chopped rosemary and pine nuts. Oh and one last thing! If you’re bringing these to a party, the grapes may be mistaken for olives given their post-roast appearance. You can either dice them up a bit, put out a sign or just allow people to be pleasantly surprised! Preheat the oven to 425 degrees F. Then, wash the grapes and slice in half lengthwise. Place into a large bowl. Add in the olive oil, balsamic, salt and pepper and toss until combined. 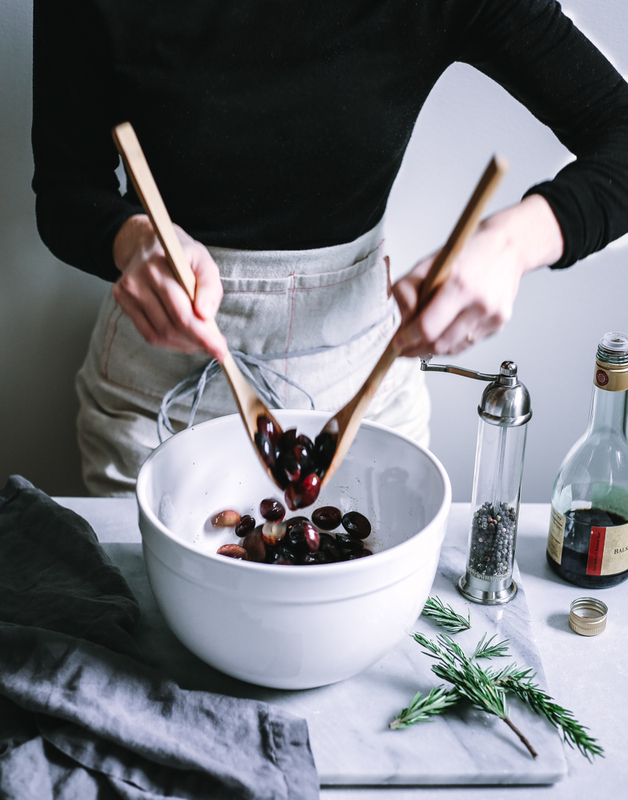 Line a baking dish with parchment paper and pour in the grapes, then sprinkle a few clumps of rosemary leaves on top. Place in the oven to roast for about 20-25 minutes or until they’ve released their fragrant juices, but still retained their shape. While the grapes are roasting, slice your baguette into oval rounds and place on a baking sheet. Brush each slice with a bit of olive oil and set aside. Then, toast your pine nuts and chop your remaining fresh rosemary. Once the grapes are finished roasting, remove from the oven and discard the clumps of roasted rosemary. Meanwhile, place the baking sheet with sliced bread into the oven underneath a low broil. Allow to broil for just a few minutes until the baguette is nice and golden and remove. Lastly, spread goat cheese on each slice and then top with a few spoonfuls of the roasted grapes. Finish with a sprinkle of the chopped fresh rosemary and toasted pine nuts and a pinch of ground pepper. Serve and enjoy!